WISE J104915.57-531906 is at the center of the larger image, which was taken by the NASA's Wide-field Infrared Survey Explorer (WISE). This is the closest star system discovered since 1916, and the third closest to our sun. It is 6.5 light-years away. Astronomers have spotted signs of a possible exoplanet in a nearby system of twin failed stars. If confirmed, the alien world would be one of the closest to our sun ever found. Scientists only discovered the pair of failed stars, known as brown dwarfs, last year. At just 6.6 light-years from Earth, the pair is the third closest system to our sun. It's actually so close that "television transmissions from 2006 are now arriving there," Kevin Luhman, of Penn State's Center for Exoplanets and Habitable Worlds, noted when their discovery was first announced in June. The brown dwarfs were spotted in data from NASA's Wide-field Infrared Survey Explorer (WISE) spacecraft, which took about 1.8 million images of asteroids, stars and galaxies during its ambitious 13-month mission to scan the entire sky. Brown dwarfs are sometimes called failed stars because they are bigger than planets but don't enough mass to kick-off nuclear fusion at their core. This diagram illustrates the locations of the star systems that are closest to the sun, and the years of their discovery. 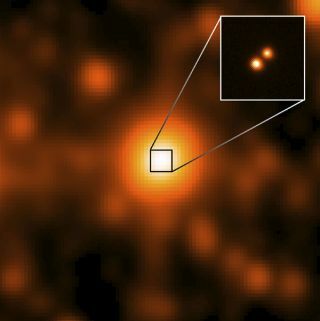 The binary system WISE J104915.57-531906 is the third nearest system to the sun, and the closest one found in a century. "We have been able to measure the positions of these two objects with a precision of a few milli-arcseconds," Boffin said in a statement. "That is like a person in Paris being able to measure the position of someone in New York with a precision of 10 centimeters." The group discovered that both brown dwarfs in the system have a mass 30 to 50 times the mass of Jupiter. (By comparison, our sun's mass is about 1,000 Jupiter masses.) Because their mass is so low, they take about 20 years to complete one orbit around each other, the astronomers said. Boffin's team also discovered slight disturbances in the orbits of these objects during their two-month observation period. They believe the tug of a third object, perhaps a planet around one of the two brown dwarfs, could be behind these slight variations. "Further observations are required to confirm the existence of a planet," Boffin aid in a statement. "But it may well turn out that the closest brown dwarf binary system to the sun turns out to be a triple system!" So far, only eight exoplanets have been discovered around brown dwarfs, and they were found through microlensing and direct imaging, the astronomers say. The team added that the potential planet in Luhman 16AB could be the first alien discovered using astrometry if confirmed. The research was detailed in a letter to the editor in the journal Astronomy and Astrophysics. It is available online on the preprint site Arxiv.